"I liked the fact that it was an apartment with TV, cable, the Internet, and a kitchen. It had everything I needed for my 6-week stay." 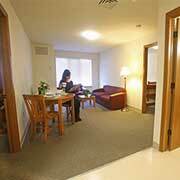 Operated by Marquette University Conference Services, the guest apartments provide visitors with a cost-efficient and convenient option for short or long-term bookings. 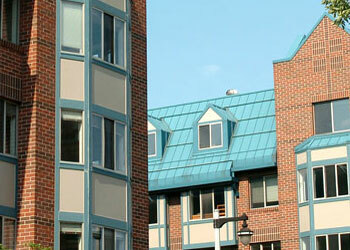 While staying at Campus Town West, Campus Town East or McCabe Hall, you'll be situated in the heart of campus and within blocks of public transportation as well as a variety of restaurants and other downtown Milwaukee attractions.The guest apartments consist of one, two, and three bedroom units that can accommodate up to six guests year-round based on availability. To inquire about reserving a guest apartment for a night, week or month, please contact us.